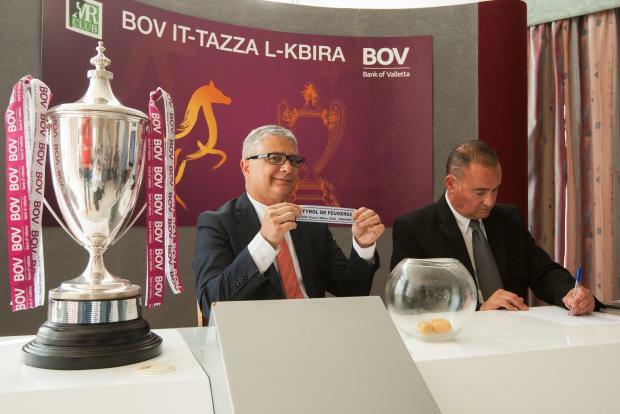 The starting numbers for the final of the ‘BOV Tazza l-Kbira 2018’ were drawn by the horse owners during a press conference held at the Malta Racing Club. The BOV Tazza L-Kbira is the most prestigious race in the local horse racing calendar and it is raced over a distance of 2,640 metres. The 12 finalists were determined from 68 top category trotters on the island following a series of six heats and three semi-finals. Unfortunately one of the horses has withdrawn from the competition prior to the draw due to injury thus the final will be disputed between 11 horses. Thomas Cunningham, General Secretary of the Malta Racing Club and Mr Charles Azzopardi, Executive PR and Marketing at Bank of Valletta, drew the starting numbers together with the owners of the finalist horses. “This year the BOV Tazza l-Kbira not only saw a bigger number of enlisted horses, but will also carry the largest prize money of the year, cementing this trophy as the highest event of the season,” Cunningham said. The final of the BOV Tazza l-Kbira will be held on Sunday April 22 with the spectacle at the Marsa Race Track starting at 1:30 pm. The field will see 11 geldings trying to engrave their name on the prestigious trophy three of whom were also in the finalist field last year – Service Secret, Midsummer King and Tanguy de Nappes whilst Brigadoon was a finalist in 2016. The field sees horses from France, Sweden and Italy. As expected a special entertainment programme is also being prepared which will include the participation of the Malta Mini Owners Club who will be showing their vehicles as well as taking part in the finalist parade by transporting the owners to the presentation area. The drivers will be brought on old horse drawn vehicles and carts. The finalists horses will be led by the 2011 Tazza l-Kbira winner Kakisis.